Iron condor trading is the best way to earn a consistent income in the options market without needing to pick stocks or time the market. You're able to exploit an inefficiency in the market called "risk premium" as investors are always scared about what's just around the corner. But what if that premium gets too low? Is it still possible to build your portfolio when volatility gets too low? Let's take a look at how it's not only more profitable... but it's also a much easier trade to manage. The most widely followed indicator is the VIX. This indicator measures the demand for protection in the S&P 500 options market. Consider it like an insurance premium. If you're a middle-aged woman with 2 kids and a minivan, then you won't have a high car insurance premium. But if you're a 20 year old trust fund baby with a bright red Ferrari in Miami... then you're going to pay up. The way we earn significant returns with iron condor trading is because most of the time, the actual risk in the market is less than what the options market was pricing in. In other words, the implied volatility was lower than the actual volatility. But what if the VIX gets really low? The question then becomes... is the juice worth the squeeze? There are two charts I'd like to show you. 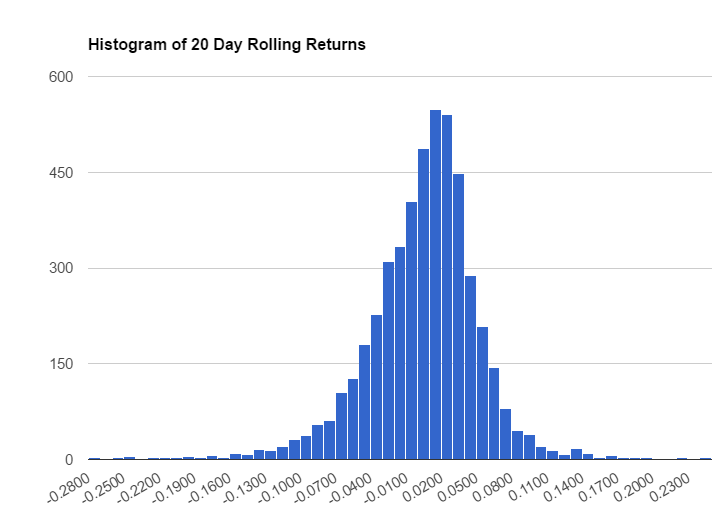 The first is the distribution of returns for the S&P 500 over a 20 day (1 month) window. The standard deviation is 4.6%. That means, about 2/3rds of the time, we should expect the market to at most 4.6% up or down. Sometimes it can be more, sometimes it can be less. Now as iron condor traders... this is where we make our money. We don't want to see large price movement in either direction. 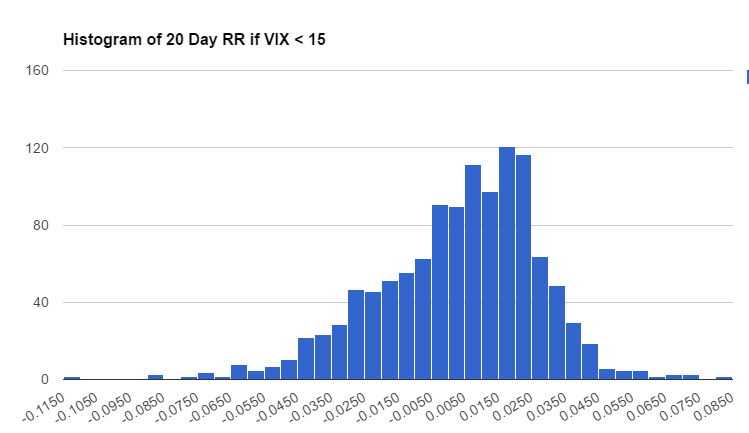 Well, what happens when we have a low VIX reading? The standard deviation is now just 2.3%. That means the actual volatility is much, much less in a low VIX environment. Remember, with iron condor trading you profit as long as the market doesn't move around as much... and in a low VIX environment this is definitely the case. Now you're probably asking... can I even get any kinds of profits from the market? When the VIX is low, you may think that there simply isn't enough option premium available to sell... that somehow the credit received is not that great. Remember, when you trade iron condors, you're selling out of the money (OTM) options. 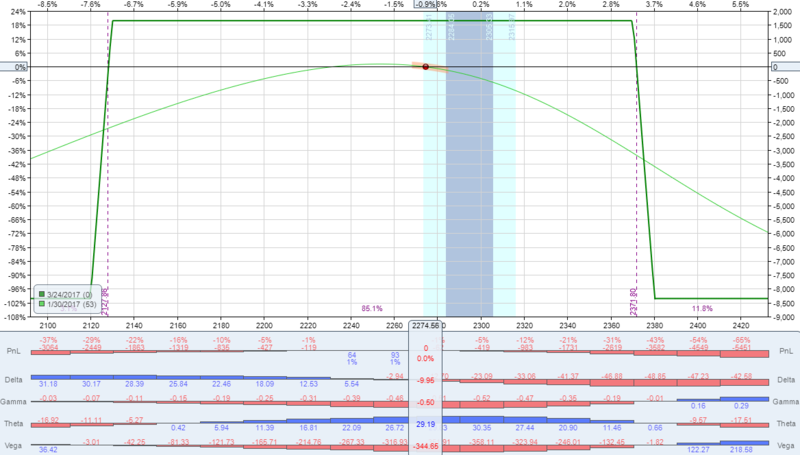 And OTM options hold their premium much better than at the money options. They are less sensitive. Think about it as a market maker. Say a customer comes to you and says they want to buy some puts that are 10% lower than current prices, and they want to pay only .10 for it. That means, as a market maker, you only get 10 bucks per contract... and if the market does manage to crash, then you're on the hook for a ton of money. You're not going to take that trade... the tail risk is not worth it. Iron condors not only take advantage of the premium available in the market, but also the tail risk pricing. It helps to push your edge even further. "What if the market crashes?" And that's a fair question. Let's take a look at an iron condor trade put on in a low VIX environment. Now take a look at where the expiration breakeven levels are. And the downside is 2127. That means you have about 100 points of upside "cushion," and about 150 points to the downside. It's because investors are always going to be scared about the downside, not the upside. You can sell options that are further out on the downside because there is more premium available. In fact, it's much easier to manage the downside risk than the upside risk. 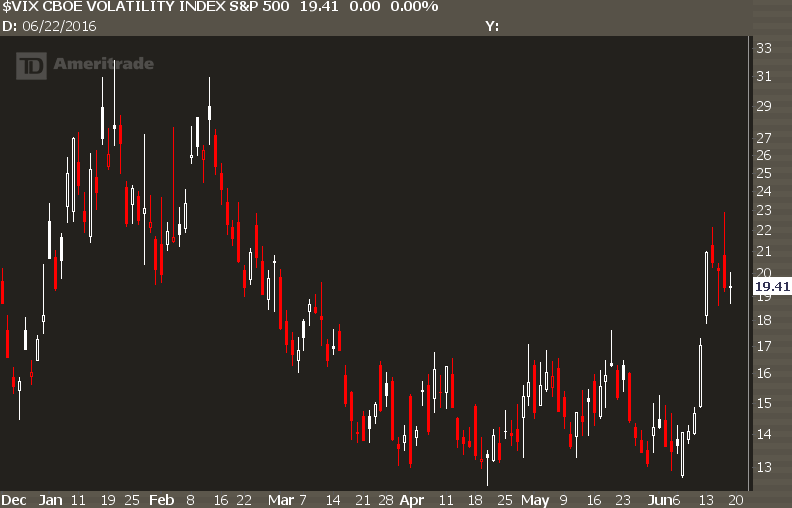 It should be clear now that a low VIX is not something to worry about when trading iron condors. They can be the most lucrative periods for iron condor traders because the actual risk is lower, and the downside is actually a little easier to manage. Yet you must make sure you have a plan in place if things move against you. Because at some point they will. If you're looking for a way to safely and consistently generate cashflow income in the market, I'd like to personally invite you to IncomeLab. IncomeLab is an options income trading service that teaches you how to generate consistent cashflow returns in the options market. As a member, you'll get access to the best kinds of income trade setups in the market-- iron condors, butterflies, calendars, and credit spreads. Each trade setup comes with the exact trade setup, video analysis of the trade, and a risk management plan to help you keep losses low. In other words, you get the exact steps you need to earn cashflow rewards every single month. I want you to see the power behind these trades, so I've made the decision as easy as possible. Start your $1 Risk-Free Trial to IncomeLab today. With your trial, you'll receive 30 days full access to your IncomeLab service. You'll start receiving cash-flow trade alerts that show you exactly what trade to take and why. I remove all the guesswork for you. After your 30 day trial, you have two choices. If you find that it's not for you, that's fine. Let me know and we'll part as friends. Yet if you see the power available in earning a reliable income in the options market, stay on as a full member for just $99 per month. It's this simple-- one profitable trade at IncomeLab can easily pay for a full year of the service!